Shidhulai Swanirvar Sangstha came up with a creative solution ‘floating school’ to bring the school to the students during the flooding. The boat first serves as a school bus, making periodic stops to collect children from riverside stops. The boat then docks and class begins. This is the way a floating school works throughout the day and arrange 3 classes. Each school consists of a classroom for 30 students, a computer/laptop, hundreds of books, and electronic resources. School provides basic primary education up to grade IV. Shidhulai introduces the river-based environmental curriculum that teaches how to protect the environment and conserve water. The solar power enables floating school to provide late evening classes to the working children. Some students get Shidhulai in-house developed SuryaHurricane solar lanterns as scholarships. Some boats have complete facility of a standing library, for example, 1,500 books, 2 to 4 computers with internet access, printer and mobile phones. 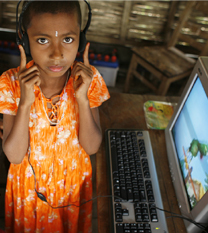 Children, youths, senior citizens, and particularly women learn computer skills and get information on agriculture, biodiversity, climate change, job opportunities, human rights, government process and services. The neo-literates who used to relapse in to illiterates are now in touch with education using the educational resources of book library. The boats use its’ solar energy to run the computers. Three cousins - Ratna, Shakila and Rupali are the grade four students of boat school in the north-western part of Bangladesh, which is seasonally flooded every year.